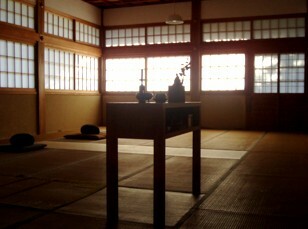 Antaiji is a place where Zen is practiced without any additions or modifications. This means that Zazen is practiced solely for the purpose of Zazen. Zazen will not get you anywhere. Zazen without gain, Zazen which is one with enlightenment, is what is put into practice here. Each single day as well as the life all year round is centered around Zazen. Therefore our life is simple and pure. Antaiji has no parishioners, and there are a minimum of Buddhist services. Instead, the self sufficient life involves a lot of work in the fields and forests. Our practice is based on the Zen motto: "A day without work is a day without food". Work and food here are directly related, with all of our actions both rooted in and aimed at the one force that keeps us alive. This life must not be an ideal - a product of the brain - but a practice which is manifested in the basic attitude of our actions in every day life. That is why we feel responsible for causing an inner revolution of ourselves, covered with sweat and dirt in summer, persevering in the snow of winter. This is no form of asceticism, but the plain, original form of Zen life, which requires long years of practice. However, self sufficiency for us is no goal in itself - it only serves to support our practice of zazen. Please bring your daily necessities including work clothes, rain gear and boots (this is important, as many jobs are done in mud and rain). Agricultural work forms a substantial part of the daily routine. While you stay here, you will be expected to perform the same activities as the monks, i.e. mainly cultivating the farmland and zazen. Antaiji posesses 50 hectares of land, on which it grows its own vegetables and rice, and the cooking is done with wood, which has to be carried from the surrounding mountains, and cut and chopped by the practitioners themselves. Staying at Antaiji, you might find that you do not have much free time left for reading books, writing letters or other recreational activities. If you feel that you could practice Buddhism on your own, there will be no need for you to come here. People who come to Antaiji do so because they want to live their lives as bodhisattvas, serving the sangha (community of practitioners) while not expecting any reward.